In this part I am going to cover the last part of how to build a web User Interfaces for the Document Management System. The next chapters will be focused in the pure client-side of a document management system, that means how to get a good interaction between some of the Microsoft Office products and Sharepoint. Sharepoint 2010 provides a new client-side dialog platform that enables information workers can work with Sharepoint objects and data efficiently. You can create your own dialogs that allow information workers to interact with your solutions by using Visual Studio 2010. Many operations in Sharepoint 2010 sites are now performed by built-in client-side dialogs. For example, the New and Edit forms for list data are rendered as modal client-side dialogs with HTTP interface. You will assume that it is a method called set_title() from the web class... NO!! you wrong, this is a property called title from the class web , and what you are doing here is setting up the title. If you go to the documentation, Microsoft will refer this property like title , so by reading the description you should assume you have a set_xxx() or get_xxx() or both. These classes are similar in functionality than the C# client-side ones. After all this theory I assume you will want to program something and see how it works. We are going step by step so you will be able to start building high-speed client-side forms. 1- Open Visual Studio 2010->new project->Installed templeates->C#->Sharepoint 2010->Empty Sharepoint Project. 2- Name the project with DocumentTypes and click ok.
3- Now... Select deploy as a farm solution and click finish. 4- Right click in the project and select add new item. 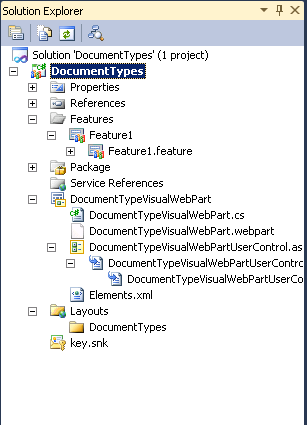 5- Select Visual Web Part and name it with DocumentTypeVisualWebPartUserControl . 6- Right click on the project-> Add -> Sharepoint "layouts" Mapped folders. 7- A new folder will be added. This folder contains all the scripts we need to comunicate with Sharepoint. 10- Copy and paste the code below in DocumentTypeVisualWebPartUserControl.ascx. &lt;%@ Control Language="C#" AutoEventWireup="true" CodeBehind="DocumentTypeVisualWebPartUserControl.ascx.cs"
12- We can build and deploy the visual web part by doing a right click into the project and deploying it. 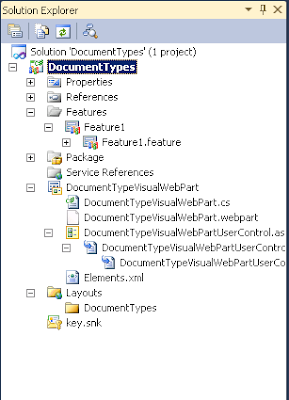 13- We can go now to a Sharepoint page and go to Site Actions->Edit Page-> Insert->Web part -> Custom and select DocumentTypeVisualWebPart . The web part will be added it automatically.